Advertising looks like an unstoppable force as it drives Google’s and Facebook’s dominance, earning them one-fifth of global ad revenues. But advertising has become increasingly disliked as it has been turned into a weaponized platform that tracks and targets every person. Now new people-first Digital Boundaries could disrupt advertising and make this a more successful world that includes everyone. The trick is giving people control of the interfaces on their digital devices. Digital Boundaries will make the user interface the world’s most valuable real estate. If you enable control by everyone, they will be the digital economy’s most powerful decision-makers with you their enabling platform. Adding user control gives you new ways to take ad leadership and revenues away from the tech giants. People will have the power to replace all or parts of their advertising, content, and consumption with what they want. They can improve their lives and guide a digital economy in new ways that benefit them. If you switch the interface to user control, people will decide the fate of advertising and consumption, and your publishing or media company can grow from both advertising revenues and connected consumption transactions. Everyone wants to control everything. People will make this their life and their economy. Your prosperity will come from helping people run the world for the first time in history. How can threatened publishers and media companies take back advertising, rise to leadership, and re-open their future? They can switch the economic paradigm from corporate-first to people-first. By giving everyone control of the user interface, people will decide how they want to live, and their screens will give them those choices. This new user interface will switch its revenues to the publishers and media companies that deliver it. Today, new people-first technology can disrupt advertising. New technologies will keep making it easier to control what screens display. Just like music CDs and printed newspapers were left behind, growing numbers of people already use a range of technologies to leave advertising behind. In the physical world, companies have published millions of catalogues and billions of coupons. Consumers skip all but the tiny number they want. On TV screens, everyone learns to use a remote to skip ads and watch only what they want to see. Almost everyone who records TV shows skip all the advertising. On the internet, billions of ads are ignored, a phenomenon called banner blindness. Rating services like Nielsen show what people actually watch, tweet about, and buy. Ad agencies specialize in buying a target demographic for a product (such as “who drinks Coca-Cola?”). When ad agencies buy those devices, they imagine these people are reached by putting ads out there. That world is obsolete. Digital interfaces are manually controlled with a mouse, finger, voice, or TV remote. Automation eliminates thousands of ads by using ad blocking which changes the user’s screens for them. Since augmented reality (AR) is being made routine by Apple and Google, hundreds of millions of users will learn how easy it is to control what their screens display. As a digital Earth arrives we will each use computing to control what we display on our screens and what we keep off them. This won’t change how people see, but computing is about to add people-first digital boundaries that expand each person’s control over how well they live, because they can control what they look at. Personalized search already does this. Your personal search history is used to customize your new searches. As a result, search shows you a unique personal view that is yours alone. Soon this growing control will expand to your screens. You already decide what you display and skip on each of your screens. With new digital boundaries, you will also control the parts of your screens. The world’s most valuable real estate will be the screens on all of your devices. Users will change the choices that are visible or blocked, which will change their consumption. That will direct the economy’s production and growth, making people-first companies leaders of their industries. As our lives and economy turn screen-based, your boundaries will emphasize your priorities, eliminate what you ignore, increase your protection, and more. Once you control your screens, you will start controlling the economy and culture. Your boundaries will help decide the winners and losers in business and society. Digital boundaries are a new answer to life’s most important question: does the world control you, or do you control the world? When you become the most powerful decision-maker, a digital Earth will be yours to command. The internet forces every kind of business to adapt. Now it’s advertising’s turn to ask: what’s next? What will advertising become as we add new digital boundaries and every person gains control? The ads and content you see will be transformed. Some people want to end climate change now. Others want weight control. Boundaries can remove fossil fuels and add healthy eating. They kill the parts of the commercial world each person does not like, and replace it with the choices that are right for them. 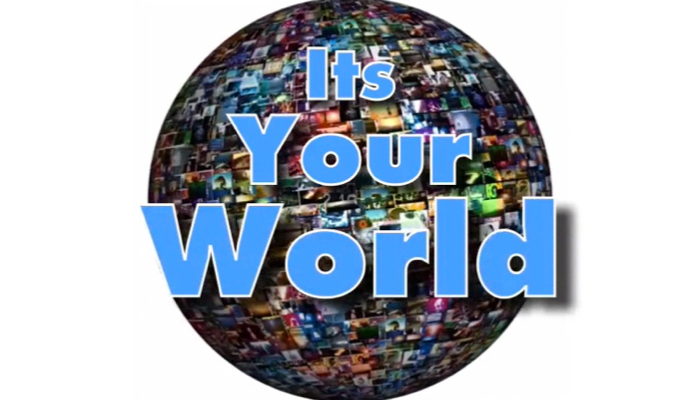 Your digital Earth will be the world you choose, with the companies and products you want in it. For tomorrow’s next-generation companies, displaying ads on your screens is only the first goal. Their ads will be living storefronts, ready for you to open one and have a live connection with that company. As soon as you connect, the company will know who you are and be ready to help or entertain you. If the company serves you well, you can add it to your connected consumption. You’ll also gain an always-on relationship by adding it to one or more of your shared life spaces. When a company starts connected consumption in your shared spaces, they’re at your fingertips. They will always serve you because your finger is on a digital kill switch. If they ever fail you, you can lock them out by flipping a digital boundary. Smart companies will satisfy you quickly without annoying you. Customer-vendor relationships will be transformed. Advertisers will serve you up front to get your attention, treat you personally when you connect, respect your needs, and deliver journeys to your quality life. Your boundaries can be on more than your mobile phone, tablets, and laptop. They can include your other screens, controlled by television set top boxes, video recorders, and game systems. But you won’t have to learn all that technology because you’re not alone. Boundaries can be run as a service by advertising services. They can also be run by publishers and media companies that support your taking control, by following your instructions on what to put on or remove from your screens or your devices. 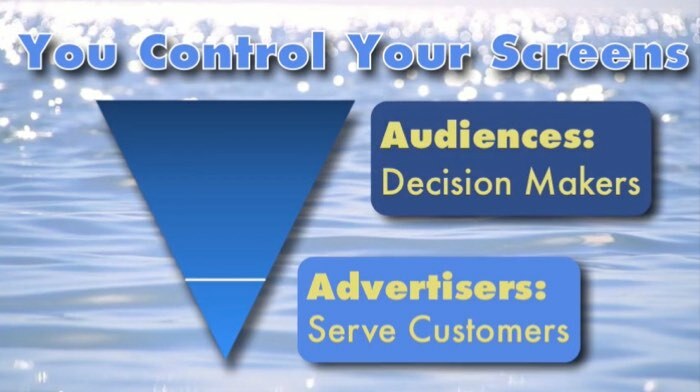 On the customer side, boundaries can earn advertising revenues from delivering the ads and content you see. On the vendor side, boundaries can earn money from transaction fees when your new connected consumption delivers the products and services you want, from your always-on companies. On the ad industry side, every vendor will know what the public does and doesn’t want. Companies can switch to selling what consumers would like to see and buy, because people will be more effective at ignoring what they don’t want. As a digital economy takes over, this changes business to visible markets with consumers in control. In these new relationships, companies will want every product to be one that consumers want to see its ads, would like to buy, and enjoy in always-on connected consumption. Those companies will lead the economy. Another digital boundary can be a personal paywall. Paywalls will give you a new income source if you want it. This will give every company an immediate financial need to listen when you tell them what you like, display the messages you want, and buy the products you enjoy. Since your boundaries know which ads you let on your screens, they can be counted for you, and you can be paid for them. We are blasted with billions of ads a year and world ad spending is over $600 billion per year. Each ad counts and they add up. What’s the Internet’s next business model? Today, the users are “owned” by the advertising platforms. They’re tracked, profiled, sold and herded to benefit advertisers. Digital boundaries transfer “ownership” to the users. Now every person can move themselves to the top by taking control. Users will control the interface, benefit personally, and guide the digital economy. When publishers and media enable this, they will rise from losers to leaders. They will empower always-on connected consumption relationships. This will replace today’s weaponized advertising with a digital economy that puts people at the top. This also adds new ways to fight Amazon‘s rise. People-first vendors will use connected consumption to make people’s lives better and easier. Publishers who supply this interface will help those companies grow to lead a people-first economy. This will be a higher-quality business model for both people-first companies and for people. Companies and customers will share connected journeys to quality living, or else consumers will use their digital kill switch and move to companies that treat them right. It may outperform Google and Facebook in advertising and content, producing ad revenues. It might also exceed Amazon in connected consumption, producing transaction and online store fees. If you’re a publisher, media company, or an advertising service that wants to take the lead, user control is a historic opportunity to turn both advertising and consumption into a people-first service that you could own and deliver. How can your company take the lead by capturing this new future? Start adding user control over the interface. Accelerate the arrival of a people-first digital Earth where everyone gets what they want, starting with their screens. With your leadership, people will control the world for the first time in history. Disclaimer: All articles in Media 2025 are provided as-is for general information. Only the issued patent, such as U.S. Patent 9,183,560 and patent pending application and specification, describe patented and patent pending technology.